Situated on a rocky spur dominating the Rimarde River, Yèvre was for a long time a stronghold occupied by Romans. In 855, King Charles the Bald gave Yèvre to the Abbey of Fleury-Saint-Benoît. At the beginning of the 12th century Louis VI the Fat bought the fiefdom and made it into a royal castellany as well as the seat of a provostship. The visit includes the ruins of the fortified castle, the postern, the fortifications, Saint-Gault church, the ruins of Saint-Lubin church and charming little village roads, classed amongst the most beutiful villages in France. Come and visit André Eve’s famous rose garden. More than 600 varieties of old and new roses, hundreds of perennials and climbers. The rose garden and the shop are open all year round. The saffron museum which is located in the former home of a wine merchant, offers a historical and educational look at saffron growing since the 16th Century. You can also see some typical tools used in the vineyards of the Gatinais area, exhibited in the wine and spirits storehouse. This museum was created to preserve the memory of those crafts which have disappeared or undergone great changes. Its twelve rooms present hundreds of tools which were used in the old days by rural craftsmen. Alongside these craftsmen’s tools, farmers’tools are also visible. The museum presents many things and documents concerning food, costumes and childhood. 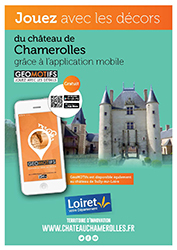 Come and discover other properties of the Loiret thanks to a visit to the Château of Sully-Sur Loire, Gien and the museum of Lorris. Château de Sully-sur-Loire, medieval Fortress, Duke of Sullys’ house. The imposing medieval architecture of the Château of Sully has dominated the Loire for seven centuries. With its high towers, its moats still filled with water and its superb conical roofs, the château gives the impression of having seen some of the finest moments of France’s history. You can visit the residence of Maximilien de Béthune, better known by the name Duke de Sully, Henri IV’s famous minister and discover the history of this family which owned the castle for nearly four centuries. The château was built at the end of the 15th century by Anne de Beaujeu, eldest daughter of Louis XI and Regent of France, on the site of a medieval fortress where Joan of Arc may have stayed. The architecture of the Château de Gien is characteristic of the beginning of the French Renaissance. Changing from administrative building to prison in turn, the Château de Gien became the International Museum of Hunting in 1952 and remains so to this day. With approximately 10,000 objects and works of art, the collection relates the history of hunting and the development of its techniques. A memorial museum that will immerse the visitor in the bleakest chapters of the history of the Loiret, a hotbed of Resistance activity which paid a heavy price in deportation. Opened in 1988 and refurbished at the end of 2009, the museum relates life in the département during the conflict through documents, testimonies, objects and weapons.